Toyota Taps into Text Messaging. Toyota is to launch a new text messaging service that will enable US consumers to text in for information about any vehicle in the Toyota range. Consumers will be able to text message the brand name of the car to the number 872257. Within seconds they will receive a text reply with factoids about the car and a link to the Toyota mobile website. The program will be promoted on out of home media screens across the US and will be available on all US phone networks. Text to Win show running on Global TV. Call TV is now a popular format around the World. Indeed, there are now entire shows, even channels, dedicated to contests, auctions and mobile dating running in Europe. In Canada, a new call to win segment is now running on Global called the Happy Birthday Show. The show runs a sweepstake type contest, where it is your date of birth that could win you the star prize. The show educates and instructs players to enter the contest by text messaging the word PLAY to 32962. A $1.00 network fee applies per entry. At a later airing, the show picks a random date from history live on air. For example June 5th 1935. If the drawn date is your date of birth, then you are a potential winner. The game awards prizes such as cars, holidays, gift cards and good old cash. The next show airs on February 2nd, 2010 at 12 PM ET. VINCOR goes for gold with SMS campaign. Vincor Canada’s Jackson-Triggs, part of Constellation Brands, is using SMS plus an Olympic theme to promote its gold medal winning wines. 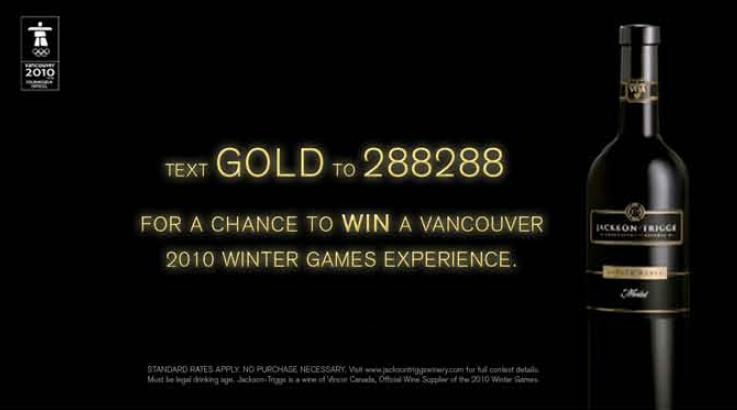 The wine company is offering consumers in Ontario, BC and Alberta a chance to win a VIP trip for two to the Vancouver 2010 winter games. To enter the contest, players simply send the word GOLD as a new text message to the number 288288. Each player also gets a “location based” mobile ticket that awards the player, plus a guest, entry to local Jackson-Triggs tasting events. The SMS campaign targets movie audiences with 60 spot cinema ad running in theatres and print adverts in Famous Magazine. The contest is only open to residents of legal drinking age in the provinces of Ontario, Alberta and BC. To enter is free but network standard rates may apply. Online? At work? Bored? I hear you. Well the boffins at B101, [CIQB-FM], Barrie’s banging beat station, may have found a way to help you pass away those office blues. The station’s new TXTclub allows club members to text in funnies, rants, jokes, groans and moans to an interactive message board, which is hosted on the station website. To activate the service on your phone, simply send in the one time registration keyword,”B101“,to the Short Code 212223. Naturally any message has to be approved by the jocks, or the beer police, for your message to appear on the screen. A $0.50 text fee applies per text. B101 is using the magRADIO platform, which enables stations to run text to screen interactivity for their websites and event screens. A BIG country congratulations to Mr. Jason Gerber of Listowel, Ontario, who has just been crowned Karaoke Star 2009. Well done. Yes, the coast to coast talent contest was back with more talented Canadian’s singing, or screaming, their lungs and hearts out. Shows aired on Country Music Television and, for the first time, a junior version, Karaoke Star Jr, featured on YTV. Viewers voted by text message for their favorite singer in each city round and then voted live for the final showdown winner. Sadly, I was gifted a sack of spuds and a showering of Charlottetown harbor water for my rendition of Achey Breaky Heart. I will be back people. Clubbers text to the floor. 101.3 THE BOUNCE, Halifax’s #1 hit music station, has launched an SMS campaign to engage with clubbers in downtown Halifax, NS. Party people, within a variety of clubs, can send flirt texts and shout outs to the number 54321. Party messages are “auto-moderated”, by the beer police, and then posted live to event display screens. Texters are further invited to join the BOUNCE txtclub by texting BOUNCE to 54321. Members who join have the ability to text requests to radio shows and partake in on-air contests. A $0.50 network fee applies per text. Be sure to check out Country Music Television weekdays for CMT Music 1pm ET | 10am PT. Text in your video requests and love greetings. To text the show live simply type CMT SHARE followed by your request or greeting. Send your text to the number 66247. Messages will be posted live on air.$0.50 per message. Your text could win you a live on air prize!